”If children yet unborn are to see any land in its natural state, we who are living today must save it for them"
"A watchdog group is essential…all that would be necessary are enough interested people to support and run it." 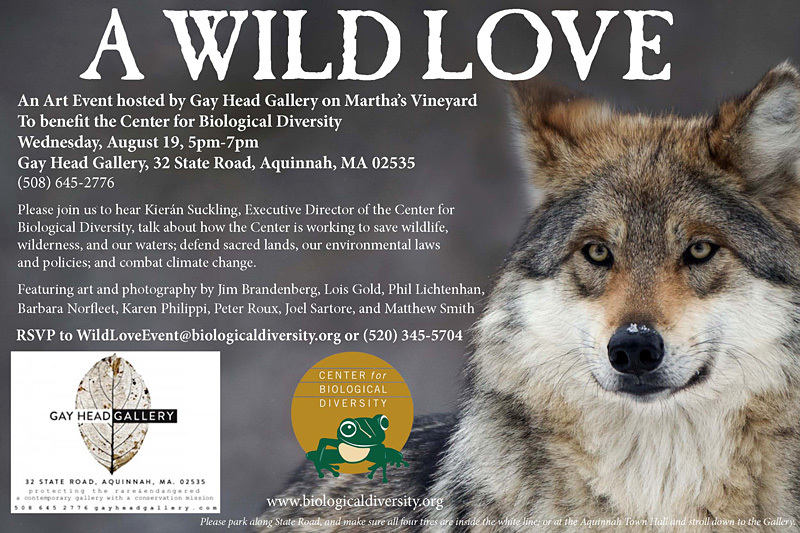 Art Event: "A Wild Love"
Art show and event at the Gay Head Gallery to benefit the Center for Biological Diversity, featuring a talk from CBD Executive Director Kieran Suckling and artworks by Jim Brandenberg, Lois Gold, Phil Lichtenhan, Barbara Norfleet, Karen Philippi, Peter Roux, Joel Sartore, and Matthew Smith. RSVP via email or call (520) 345-5704. More info at Gay Head Gallery. A public forum with the Mill Brook Watershed Management Planning Committee to provide updates, discuss progress, and answer questions on the Mill Brook Watershed Study. 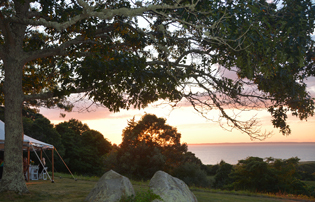 Free, at the West Tisbury Library. A Felix Neck program that explores a different aspect of Sengekontacket Pond each week. From the birds above, to the creatures below the water's surface, this program includes hands-on activities for all ages. Free, sponsored by Friends of Sengekontacket. 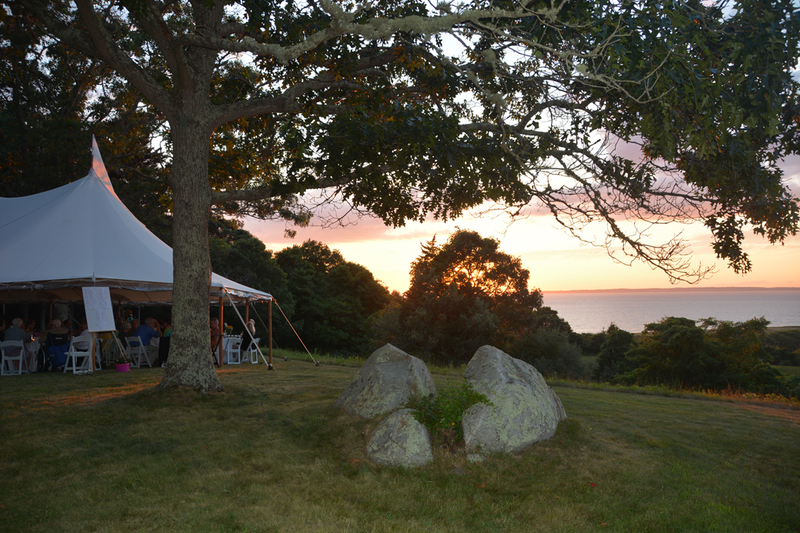 For more info, call (508) 627-4850 or see Felix Neck website. Naturalist Charley Eiseman leads a presentation and field exploration for gallmakers and leafminers, two fascinating groups of tiny insects that leave behind distinctive signs as they feed inside their host plants. At the Polly Hill Arboretum, $15 ($10 for members), more at website. Saturday, Aug. 29, 11:00 am to 3:30 pm, Katama. The Farm Club, a year-round program held on the last Saturday of the month, presents a lower-cost option to experience what the FARM Institute has to offer. Membership costs ($10 per session) are matched and placed into an account to be used for projects and trips. For more information see website, email, or call (508) 627-7007. Many thanks to all who attended our 50th Birthday Party on August 5th, and everyone who helped make it happen, including our wonderful auctioneers, musicians, volunteers, staff, and sponsors. So, what has VCS been doing all these years? It's not a question easily answered in this space, but for starters check out this very nice story and the accompanying slideshow from last week's Vineyard Gazette, built around quotes from artist Allen Whiting (who participated in the Fresh Paint event) and Executive Director Brendan O'Neill. Or, for a deeper look into the 50 year history of VCS, take a look at the most recent newsletter (caution: very large file), a historical retrospective full of interviews with early leaders and selections from the news archives. Where do the Presidential Candidates Stand on Climate Change? If you’ve ever wondered where the thriving multitudes of 2016 Presidential candidates stand on climate change, Yahoo News has a helpful roundup. Through quotes and inference from previous political actions, the story does a nice job of going beyond the candidate's self descriptions and presenting what policies they might support if elected. "When I go to a restaurant and I order a bottle of wine, I’m presented with a wine list that tells me what year the wine is from, what vineyard, what kind of grape; I know whether it’s a blend, I know where it’s from, sometimes I even know down to the specific region. If I knew half of that information about my seafood, we’d be getting someplace." Even if the comparison is a bit tenuous (wine grapes aren’t harvested in international waters, poached with impunity, and mislabeled as they pass through multiple countries of origin), it’s a reasonable point: for consumers to make informed decisions using the info from Seafood Watch they will need accurate product descriptions from stores and restaurants. And since that information won’t be forthcoming without consumer pressure, the only solution to this chicken-and-egg (fish-and-egg?) problem is for all of us to just keep asking where the fish came from – even when you know you might not get a good answer.